The Wine Bloggers Conference of 2009 is where I had the opportunity to sample the 2006 Oroppas Bordeaux Blend and prior to this I had only read of and heard about their reputation for making outstanding wine, this effort was no different. St Clement was part of the Grand Tasting line up held at Quintessa Winery a beautiful property encompassing some 170 acres of vineyard on Silverado Trail in St. Helena, Ca. The line-up of Napa Valley Vintners read like some cork-dorks "Who's Who" list of top Napa Valley Wine makers. It's what I would call First Class event and I was so appreciative of this opportunity. Tables were set up along the many rows of fermentation tanks in what seemed like a Taj Mahal size building, truly impressive. You had to see and experience it to fully appreciate the grandeur of this event. Perhaps, a little wine writer like myself is too easily impressed, but I did feel a bit like "hey, "I've arrived". If you are one of those folks who say, "no one reads blogs" if so then to you I say, really? Perhaps you can explain why in 2009 Napa Valley vintners collectively rolled out the "red carpet" for a bunch folks who [supposedly insignificant] are writers such as myself, representing the many wine blogs you find in plentiful numbers on the net, chock full of articles on the subject of wine. Why then is this post [the one you're looking at] listed in the Google search results as the number two item of relevant inquires. Maybe it's because the see we are the up and coming New Media and they want to be ahead of the curve during the "changing of the guards". 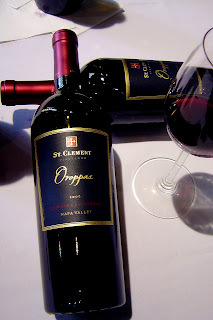 Okay so enough about that, the reason for this review and of the many still to come sitting in a some-what neat pile on my desk is the 2006 Orappas from St. Clement. I was surprised to see this wine at the tasting but they didn't call it "grand" for nothing. The Winemaker Danielle Cyrot from St. Clement Vineyard was there and pouring her amazing 2006 Orappas and folks let me tell you something this wine to me represents part of what makes Napa Valley such an great place to grow vines and make wine. Now unfortunately for me I've not tasted any of their other wines so I don't have a real comparison of their other offerings but I have a sneaking suspicion that this wine is just the tip of the iceberg. I wanted to take a closer look at this wine, so I took my sample out the massive metal rolled gate entrance which spills out to the vineyards to take a closer look at my sample. I wanted to make a "some-what" serious attempt evaluating this wine and write some quick notes about my impressions. Luckily for me there was a vine end post [which if treated, can make the difference between being labeled organic or not when you're 99% organic] nearby to rest my glass upon while I scribbled away a few notes of excitement about this wonderful wine. Some of the other folks may have wanted to hit every table, but I thought it be great to focus in on just a few wineries I only knew by reputation and that's what I did with St. Clement. So now on with the review. Splash and Swirl: This wine has nice viscosity, the color was vivid deep ruby colored core surrounded by a lightly colored cerise rim. Sniffity-Sniff: After putting my nose into the glass it was immediately enveloped by loads of ripe plum and blackberry fruits, while also picking up notes of cream and espresso, just wonderful. Long Slurp: This where things really got interesting a rich yet supple mouth feel with a slight meaty edge to the plump dark berry, and cherry glowing delightfully upon my palate, while swirling around a generous core of blackberry and licorice flavors flowing effortlessly to the long polished finish. ABV and Price: The wine weighed at 14.5% abv and pricing on this wine varies from $55.00 to purchase from the tasting room or website. It can also be found for about $34 -$49 at some retail shops around town and the same for buying it online, excluding auctions. What's the Score: I gave this wine 92 points on the CCWB point scale. From my perspective, many wines of this caliber could earn higher points if the prices were somewhat in what I would call the more reasonable range. Still this wine is just fantastic, nearly a perfect in all aspects. But I can find wines of similar finesse, pedigree and structure for a more reasonable price. Vineyards: Hillside Cabernet Sauvignon vineyards on Diamond and Howell Mountain, as well as Mount Veeder, contributed to the blend along with valley floor fruit from Rutherford and St. Helena. The Blend: Ya know I really love blends and this one is no exception. Composed primarily of 86% Cabernet Sauvignon 9% Merlot, small amounts of Cabernet Franc and Petite Verdot were blended in to enhance the structure and mid-palate weight. Each part of the blend was aged separately in French Oak for nineteen months and blended together just before bottling. My Recommendation: If you are a huge fan of Bordeaux blends like me then this is one wine, then I would definitely recommend grabbing a few bottles of this rather amazing juice. They have huge track record of producing wines which typically score 90 points or more from many of the major wine publications. On the flip side of the equation, in my economy and I suspect many others economies, this wine could not be labeled as an "everyday drinker" especially in this price range. However, it's definitely a wine you'll want to have for the weekend or for special occasions. Also makes a great gift for wine connoisseur friends who may drop by for dinner or make the perfect gift for the hard to impress boss, who just may be the one to assist you in climbing the ladder. Other Voices: Wine Spectators, James Laube who sampled this wine blind on April 1, 2009 had this to say about the St. Clement 2006 Oroppas, "it's ultra-rich and concentrated, delivering plush blackberry currant, black cherry and spicy anise that are pure, focused and full-bodied, with a long persistent finish that ends with a supple texture." and gave it a great score of 92 points and should be just now hitting its stride from 2011 through 2017. Napa and Sonoma Valleys Magazine: Choose St. Clement Winery -- "Best Boutique Winery" two years in a row. Until next time sip long and prosper, cheers!